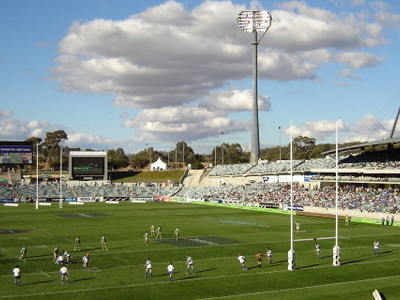 Canberra Stadium (originally known as Bruce Stadium) is a facility primarily used for rugby league and rugby union games, located adjacent to the Australian Institute of Sport in Canberra, the capital of Australia. Bruce is the Canberra suburb where the stadium is located, and in turn Bruce was named after Stanley Bruce, Australian Prime Minister 1923–1929. Constructed in 1977 for the Pacific Conference Games, it also was the venue for the 4th IAAF World Cup in Athletics. At the latter meet, the fastest 400m for women, was recorded by East German Marita Koch, and also the 4x100m women's relay by East Germany – times that still stand today. 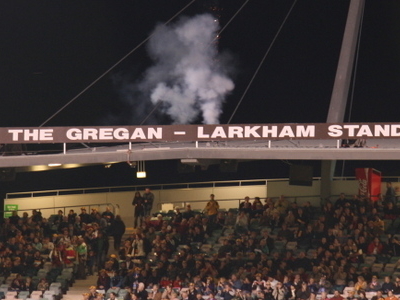 In the late 1980s the running track was removed and re-located to the warm up stadium at the AIS site and in 1990 the Canberra Raiders Rugby league team started playing their home games at Bruce in 1990 after they became more successful. 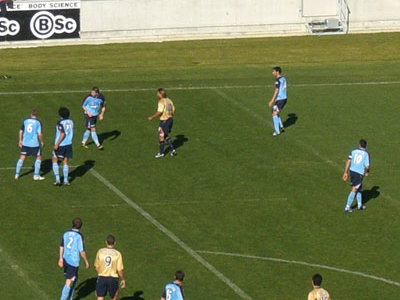 Here's the our members favorite photos of "Stadiums in Canberra". Upload your photo of Canberra Stadium!